Buy more and save more. Save up to 25% off. When you purchase a Lion Energy L-1500 Generator. With the purchase of any Family Food Pack. Includes: Three (3) Pouches of Quick-Fix Meals Four (4) 1-cup Servings, or Two (2) Hearty Meals per Pouch Food Planning Guide Helps Calculate How Much Food You Need 30-Minute Audio CD by Steve Shenk, eFoodsDirect Co-Founder Catalog of Products. Pay only shipping & handling. We live in trying times. Emergencies can take on many forms from storms to power outages and being prepared is your best defense. eFoodsDirect helps you get ready with great deals on quality quick fix meals, survival tools, grab & go kits, and more so you don’t have to wait for disaster to happen to you. Start stocking up on supplies, and savings too, by using an eFoodsDirect coupon code on your next order. As we’ve all seen, severe weather, unstable economy, terrorist attacks, contamination, and shortages are all a harsh reality. The good news is that eFoodsDirect lets you fully stock your food supply before disaster strikes. eFoodsDirect offers a wide range of delicious, nutritious, and easy to prepare dehydrated meals (some of the menu includes Tortilla Soup, Beef Stroganoff with Pasta and Cheesy Chicken Casserole). With an average shelf life of 15-25 years, eFoodsDirect products allow you to eat it today and store for tomorrow. On top of carrying the leading products in food storage and security, eFoodsDirect also sells an endless selection of accessories to help you prep for the unexpected including books, garden seeds, masks, fuel, power, and water purification systems. As their way of practicing “serve, save, and share,” they also provide free online articles, audio from co-founder Steve Shenk, seminars, and an up-to-date blog to educate and help you plan in the event of the worst case scenario. For more than ten years now eFoodsDirect has been in the business of putting people first. They strive to deliver world class survival and food kits, all of which carry the Nutriversal seal of excellence and in addition to being vegetarian and kosher certified are also MSG, trans fat, lactose, irradiation, hydrogenated oil, and genetic modification free. Their mission includes building innovative brands, which promote independence, prosperity and security that help improve the lives of everyone they reach. 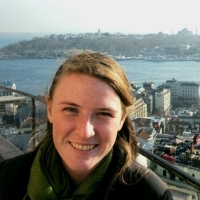 In a time of crisis, advance planning can be the difference between life and death. eFoodsDirect is giving you life saving skills and supplies while we at CouponPal bring you the deals that help you avoid financial disaster. Prepare for the worst but stock your home with the best. Use an eFoodsDirect coupon at checkout so you can save those extra dollars for a rainy (or worse) day. In an unpredictable world, eFoods Direct allows you to prepare for emergencies and food shortages so that your family won't have to go without. At eFoodsDirect.com you'll find a selection of tasty, healthy, and storable meals. Follow these directions for using an eFoodsDirect coupon code to keep your wallet as full as your stomach. 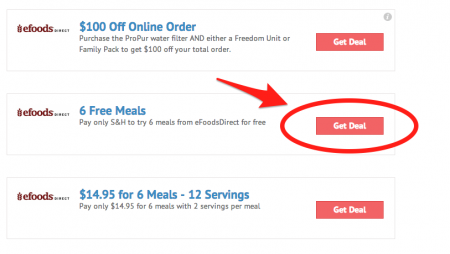 Choose an eFoods Direct coupon at CouponPal.com. Click "Get Deal" or "Get Code." The eFoods Direct website will automatically open in a new window. If your coupon requires a code, a separate window will pop up with the promo code. Highlight and copy the coupon code - you will need it at checkout. Check out the various meal plans and options available at eFoodsDirect.com, and find what's right for you. Click "Add to Cart" for anything you wish to buy. If you chose an eFoodsDirect coupon without a code, your discount will be automatically reflected in the price you see in your shopping cart. If you chose an eFoodsDirect coupon that requires a code, enter the code in your shopping cart on the righthand side where it says "Enter your coupon code if you have one." Then click "Apply Coupon" to calculate your updated order total. Before you enter your payment and shipping information, you will have the option to create an account at eFoodsDirect.com. Then enter your information and place your order. You're done! You never know when calamity could strike. That’s why you need to be prepared if a catastrophe ever ends up affecting your family. eFoodsDirect can provide you with supplies for up to one year. Their products could end up making all the difference to your loved ones. Here are a few of the reasons why you should be buying products at eFoodsDirect. eFoodsDirect Family Food Packs not only provide you with necessary nutrients, they’re also super tasty! Their items, including soups, pastas, and desserts, contain healthy ingredients, fiber, and whole grains. Even though the packages are meant to be preserved, you don’t get any of those nasty trans fats or MSG that’s often added to these types of meals. Also, your family will love the variety of foods offered. There’s definitely something for everyone’s taste buds! The foods are extremely quick and easy to prepare for your family. All you have to do is add boiling water and let the meal simmer. Within 20 minutes, you’ll be ready to eat! This no-fuss approach to cooking is also a great option for families that don’t have a lot of time to prepare meals during their day-to-day busy schedules. It’s important that the foods you purchase are there when you need them. So eFoodsDirect created most of their products to last more than 25 years. There are a few exceptions, including eggs which have an eight-year shelf life or baked goods mixes which have a three-year shelf life. But the majority of items will be waiting for you if your family ever faces a disaster. They’ve specifically packaged everything in oxygen-free materials, so that your products will always be devoid of bacteria. Buying enough food to feed your family for a year could end up taking up a lot of space in your garage or basement. So, eFoodsDirect designed products that only take up a minimal amount of space in your home. Their containers are easy and convenient to store, and they’ll protect your food from the elements. Perhaps the most beneficial aspect of eFoodsDirect products is that they’re inexpensive! Normally, buying food supplies for your entire family would be extremely costly. In fact, according to the eFoodsDirect website, the Official USDA Food Plan noted that the average monthly cost of food for a family of four ranges between $637 and $1,2600. With meals at eFoodsDirect only costing between 50 cents and $2, you could end up saving tons of money! Your family’s well-being should always be placed above money, and now you don’t have to worry about overspending on supplies. eFoodsDirect knows that protecting your family is your number one priority. So, their products can give you complete confidence that you can provide for them when they need you the most. There are definitely more than five reasons you should buy products from eFoodsDirect, so check out their website for even more proof that their items are the best on the market! eFoodsDirect is dedicated to providing you and your family with peace of mind if disaster ever strikes. Their Family Food Packs can supply your loved ones with food for up to one year. Their products could make all the difference in the world if you’re ever faced with difficult circumstances. Here are some questions you might have about eFoodsDirect. Why isn’t my eFoodsDirect coupon code working? If your eFoodsDirect coupon code isn’t working when you go to purchase supplies for your family, check to make sure there aren’t any limitations with the deal. 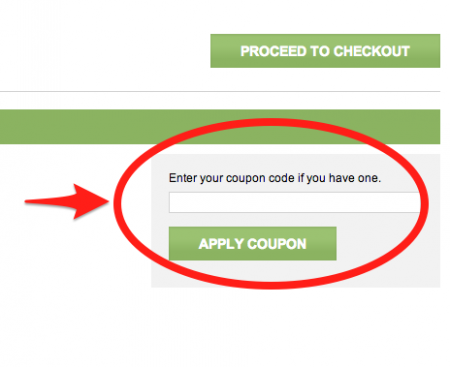 Things like expiration dates or minimum size orders can prevent your coupon code from being applied at checkout. You can reach customer service by calling 1-800-810-4441, Monday through Friday from 9 a.m. to 5 p.m. (MST). You can email them at Contact Us. eFoodsDirect also has a Live Chat option if you’d like to speak to someone immediately. Unless you received an eFoodsDirect coupon code for discounted shipping, you are responsible for shipping costs. These charges are determined based on the location and the size of your order. For more information, go to Shipping and Returns. They currently accept American Express, Visa, MasterCard, and Discover. eFoodsDirect wants you to be 100 percent satisfied with your order. You can return unopened items within 20 days for a full refund. There is a 5 percent cancellation fee, and you are responsible for the return shipping costs. To return items, you must contact customer service to get a Return Authorization Number. For more details, go to Shipping and Returns. Will I have to spend a large amount of money to buy these supplies? In fact, eFoodsDirect can save you a ton of money on food supplies. On their website, they relate that the Official USDA Food Plan says that the average monthly cost of food for a family of four is between $637 and $1,260. 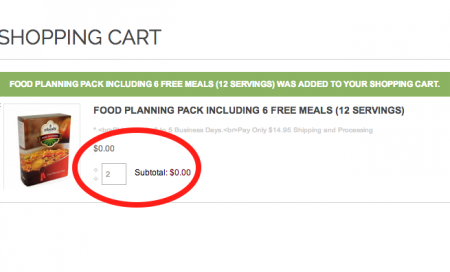 You can buy meals at eFoodsDirect that range from 50 cents to $2. Therefore, these dehydrated meals are much more affordable than freeze-dried items. Plus, when you go to their website, you can get six free meals to sample!